Celtic midfielder Christie and Aberdeen skipper Shinnie, who both started their careers with Caley Jags, will face each other in tomorrow’s Betfred Cup final at Hampden Park, with the pair having established themselves as regular picks in Alex McLeish’s Scotland squad in recent months. 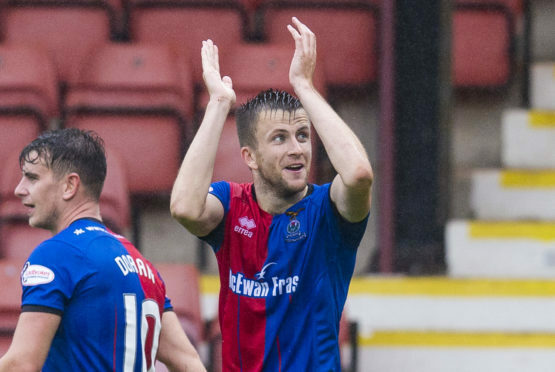 Polworth played with Christie and Shinnie before they both moved on following Inverness’ Scottish Cup win in 2015, and the 24-year-old is not surprised to see them thrive at the peak of the Scottish game. Polworth said: “In the last couple of months I’ve been watching Ryan on the television for Celtic and Scotland and he has been doing brilliantly. “He has pretty much become a mainstay in the Celtic team. “He looks a lot fitter, a lot stronger and a lot quicker as well, but on the ball he has always been really good. “Celtic have obviously taken him aside and worked on those areas – and that’s why we’re seeing the best of him now. “Coming up through the ranks, Ryan was always one of the best at the club. The way he has kicked on has been brilliant. “With Graeme Shinnie also doing well for Aberdeen and Scotland they are both flying. “Graeme has been the top man at Aberdeen for a good few years now and it is brilliant to see lads who have come through the club do so well. Caley Jags manager John Robertson could hand some of the club’s young prospects an opportunity due to his depleted squad, with today’s Championship match against Falkirk the first of three games in seven days. Polworth became Inverness’ youngest player aged 16 years and 211 days when he made his debut in a 2-0 victory over Hibernian in May 2011, before his record was taken by Daniel MacKay last season. Inverness-born Polworth feels the club will be rewarded for giving youth its chance, adding: “We haven’t got the biggest of squads at the best of times. If we have a few injuries, the squad starts to struggle and we need to take some of the young boys up. “I’m always delighted for them when any of the young lads get a shot coming up into the first team. “We’re that low in numbers we’re probably going to have to start a few sooner or later, but it is a brilliant chance for them.